As a dedicated DIYer and a self-proclaimed aficionado of any and every homemade cleaning product out there, I have to say: I use a LOT of baking soda. To anyone who makes their own eco-friendly cleansers and cosmetics, you know that baking soda is your best friend. It’s safe, neutral, edible, and incredibly effective in everything from nontoxic DIY drain cleaner to all-natural homemade deodorant. But after years of using this stuff on a daily basis, it sort of struck me -- I don’t actually know what it is! So I went searching. Turns out, it’s really not as simple as it seems. NaHCO3, aka sodium bicarbonate, aka baking soda, is a chemical salt that occurs in its natural form as the mineral nahcolite. NaHCO3 is an amphoteric compound, which means it may react as an acid as well as a base, although in aqueous solution it is slightly alkaline. Also, other fancy chemistry words. Moving beyond the scientific jargon, I think what really matters to all us eco-conscious DIYers, is the impact that baking soda has. Where does this stuff come from, anyway? And why the heck is it so good at doing the things we want it to do? There are deposits of pure nahcolite which occur naturally in the Green River Formation, which spans a few states in the Central US. The Green River Basin alone houses a 200-billion ton nahcolite deposit -- enough to supply the entire world with baking soda for many hundreds of years. These natural deposits at the Green River Basin are commercially mined by many companies. Some mine it directly from the ground and sell it as is, in its natural state. Other companies extract and then refine it, by heating it and treating it with chemicals (not necessarily bad ones, but chemicals nonetheless). Either way, mining results in a relatively low-impact, relatively environmentally-friendly product. 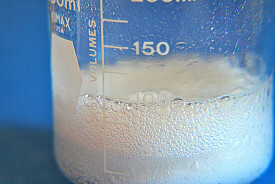 Baking soda can also be created through a series of chemical reactions known as the Solvay process. This method uses carbon dioxide, ammonia, and sodium chloride as the raw materials. Unfortunately, these are pollutants. The Solvay process has its issues, especially with disposal of toxic chemicals. Because of this, more and more producers are moving away from the Solvay process, towards mining and refining. And how! It really does. Baking soda is actually a crystal, and as a fine powder it creates an effective, yet gentle, abrasive. This is why it’s so great on countertops, tile, and toilets, as well as on teeth. In water, baking soda is mildly alkaline and can be used to neutralize acid. That’s why it works so well dissolved in water as a natural antacid remedy, or as a way to remove rust from old metal, or to remove tarnish from silverware. Its alkalinity is also why it acts as a deodorizer -- by counteracting slightly acidic scent molecules. But baking soda's amphoteric qualities come in useful too. That’s how it enhances homemade laundry detergent and clears up pools and fish tanks, by balancing the pH level. The bottom line: Yes, baking soda is natural and environmentally-friendly. Best of all, it actually does all the things we use it to do -- even science says so! So when you call that Dallas cleaning service, ask them to add a little baking soda to their repertoire!